Notes: Rick Fridell, Priscilla Summers and Steve Summers saw the bird on 4 Oct. These photos were sent in by Steve Summers along with a description taken from his notes. 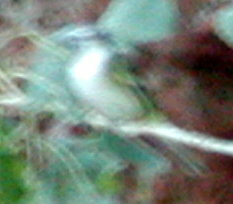 The Blue-headed Vireo was probably the one Larry Tripp found here two days ago. It was in the same location around the 3rd Tee. A very bright “Solitary” Vireo. 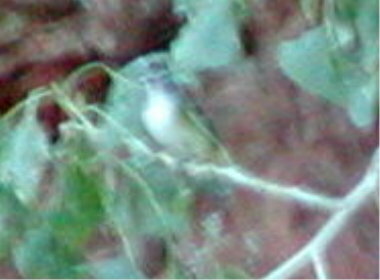 The head was a dark gray contrasting well with the very bright white throat, giving the bird a somewhat hooded appearance. 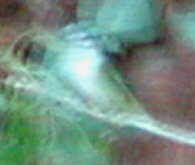 The bird was very white from the throat through the belly. The sides, flanks and vent were bright greenish yellow. There were two very yellow and distinct wingbars as were the rest of the wing edges. The white eye spectacles were especially large and bright. We did not get a good look at the head-back contrast but there was a definite contrast which I think can barely be discerned in the poor photos I was able to take.